The ebb and flow of this young family’s life forever leads back to the sea. The ocean has long been a constant in Thandi and Bachelor Tipene’s lives. It drew them together at just 18 and 22, when they met on a New Plymouth beach while checking the surf, and now, in their new home, it’s become their young family’s permanent backdrop. OPENING IMAGE Sliding doors on two sides of the house reach right to the ceiling, upstairs and down. During the day, Thandi pulls the sheer linen curtain in the living area to let the ambient light filter through it. TOP Sandy feet are no big deal in this home, thanks to concrete and plywood flooring, with rugs from Freedom Furniture and The Virtue (pictured below). Thandi sourced the L-shaped sofa and coffee table through her business Thandi Jazmine Design to create a cosy zone in this open-plan space. The cushions are from Città and Etsy. ABOVE The TV is kept out of sight inside a recessed black ply cabinet flush with the fire. 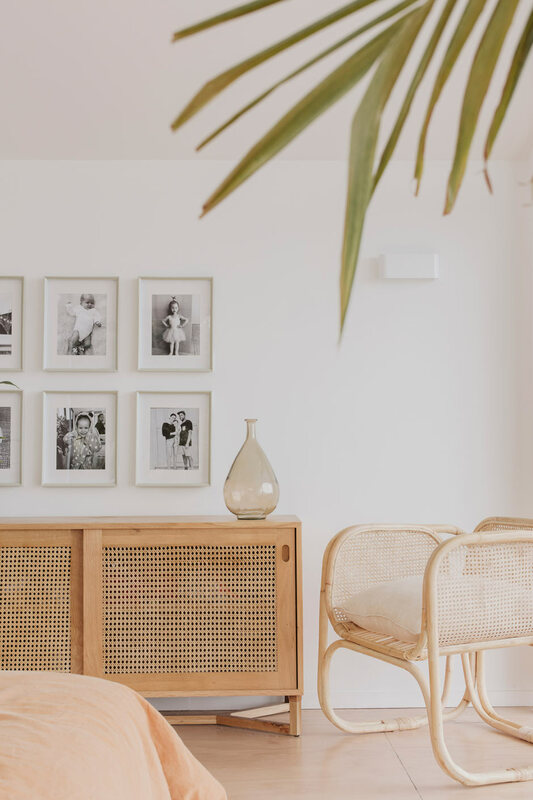 “Bachelor is interested in minimalism and technology, and has an automation system designed into the house, so when he gets the time he’s going to put the TV, lighting, motorised blinds, stereo, internet and everything into it,” says Thandi. For now, the lighting throughout the home can be dimmed or brightened as required. Thandi and Bachelor grew up in Waipae and Patea respectively, in houses right on the beach. She’s been surfing since she was 10, and Bachelor since he was five, and together they’ve travelled the world with the sport, representing New Zealand and winning national and Aotearoa Maori titles. 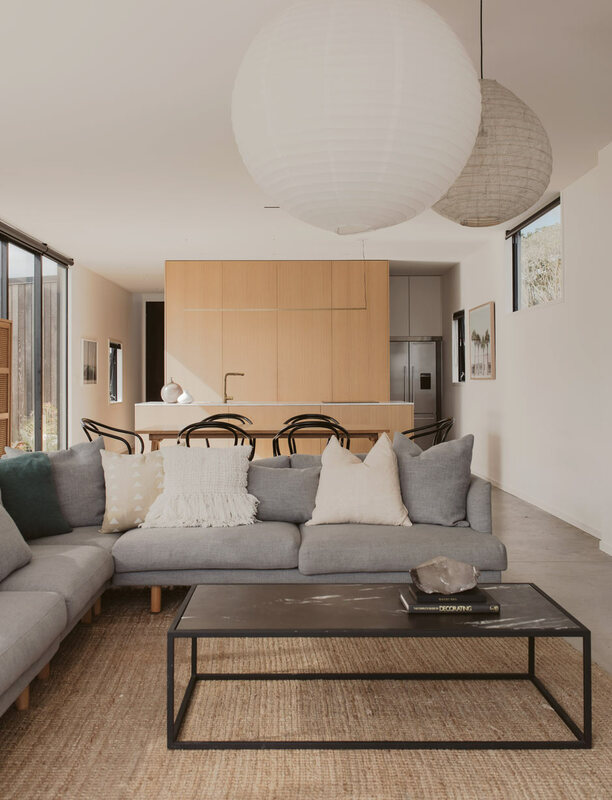 Not long after they met, they went for a spin up one of Taranaki’s most sought-after clifftop streets and fantasised about one day living there. Ten years later, on a random drive by, they noticed a for-sale sign and decided to give it a shot. To their surprise, their offer was accepted – they were on their way to realising their dream of building a home from which they could see the sea. ABOVE Thandi and Bachelor’s shared aesthetic – minimal with thoughtful touchpoints – is embodied in the kitchen. 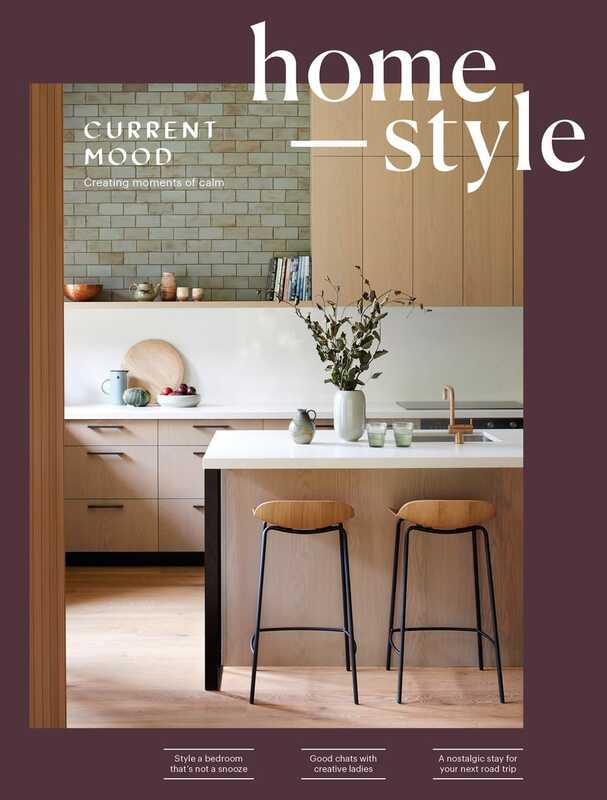 They designed and made this brass strip pendant themselves with assistance from Powersurge Metalworks, and chose honed Alarti Grigio marble by Artedomus for the benchtop and brushed brass Buddy tapware by Plumbline. The dining table is from Thandi Jazmine Design. 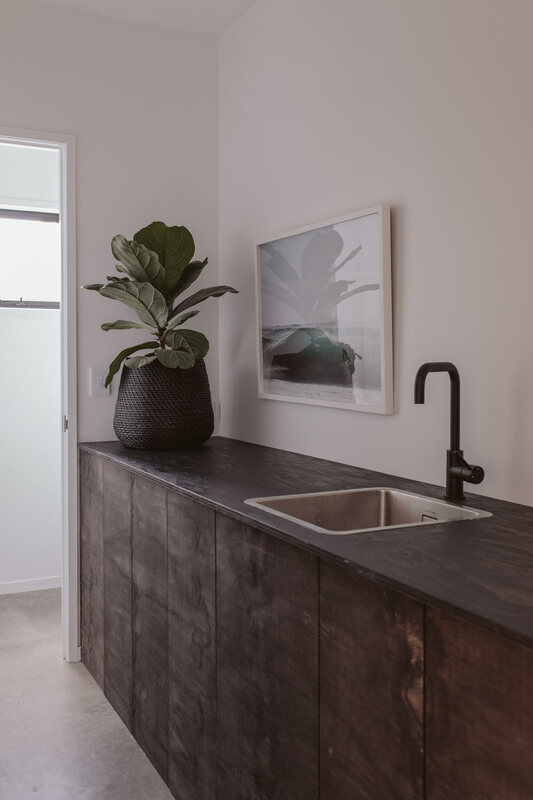 ABOVE The elegant monochrome scullery features stained black plywood and matte black Meir tapware from The Kitchen Hub. The greenery throughout the house is from Tropical Treasures Taranaki. 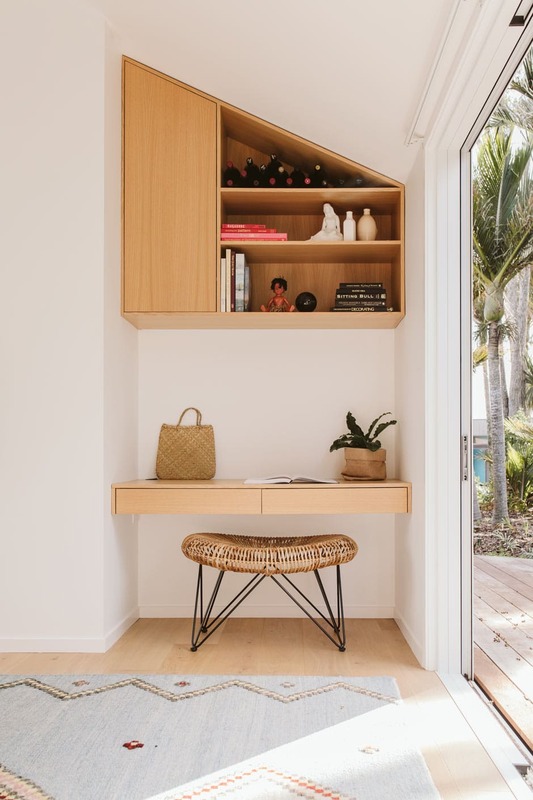 The pair began the project with the help of John Irving of Studio John Irving Architects, whom they’d met a decade earlier on their honeymoon at a surf camp in Samoa. Seeking “an upscale bach connected to its surroundings”, they gave him a one-page brief and five images of designs they liked, then left him to it. He came back with exactly what they wanted. 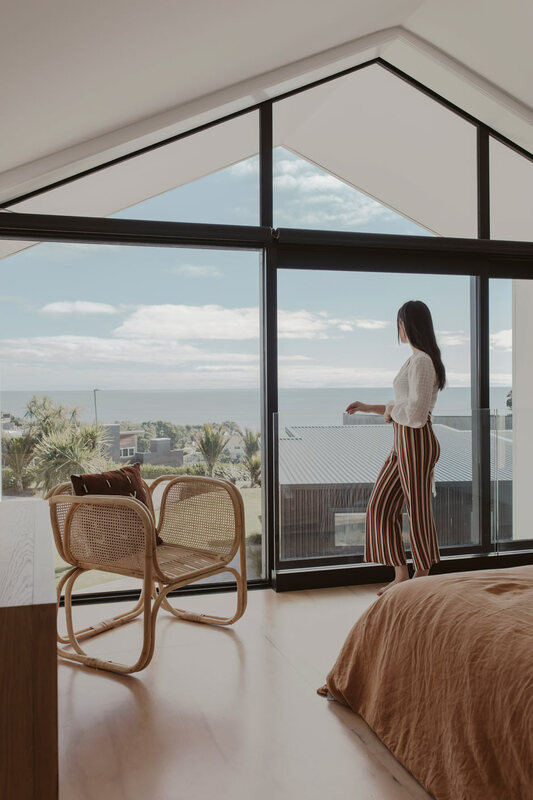 To maximise the view of the beach below and allow them to see not only the swell but also the glinting black sand, the Tipenes’ home built by Chris Bell Construction is set on an angle and elevated 0.6m off the ground. Its street-front façade is glass bottom to top. 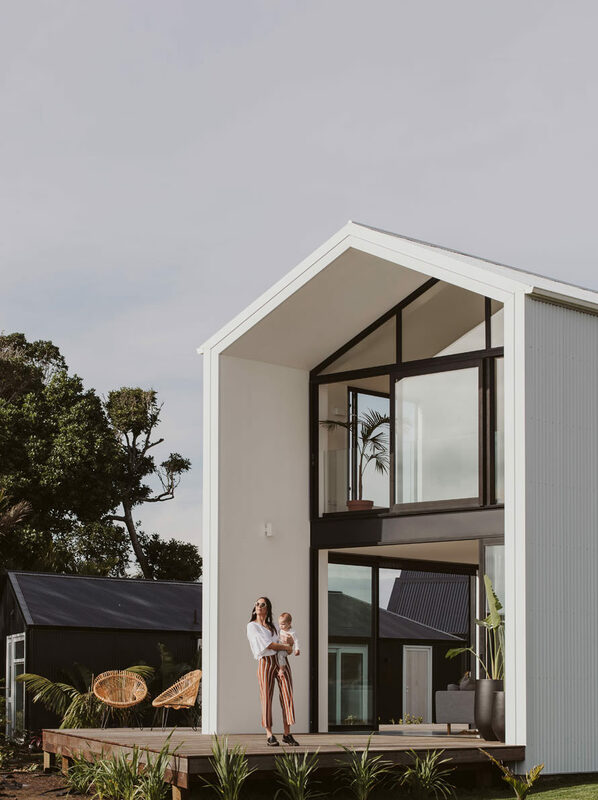 The gable roof and True Oak Corrugate that enclose the soaring voids within reference snow-capped Mt Taranaki, while black joinery frames outlooks of the ocean and native bush. It’s simple, yes, but contemporary too. MASTER BEDROOM “The best thing about our home is waking up to the view and watching the west-coast sunsets,” says Thandi. “We cut down the legs on our bed to bring it lower to the ground, which makes us feel more connected to the water – if you lift your head just off the pillow, it feels like you’re on it.” Family photos decorate the wall above a Raffles cabinet from Freedom and chair available through Thandi Jazmine Design. 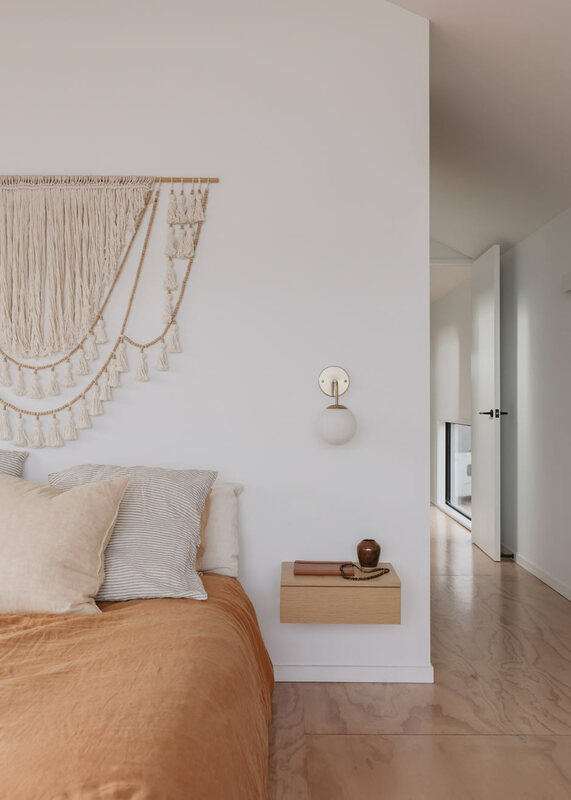 The wall hanging was an Etsy find, the bed linen is by In Bed, the Opal Globe sconces are by Mr Ralph and the floating bedside tables were made by Objects Custom Joinery. Sliding doors with a glass balustrade usher the sea breeze into the couple’s bedroom and ensure it doesn’t overheat in summer. To maximise their budget, the couple rolled up their sleeves whenever they could. 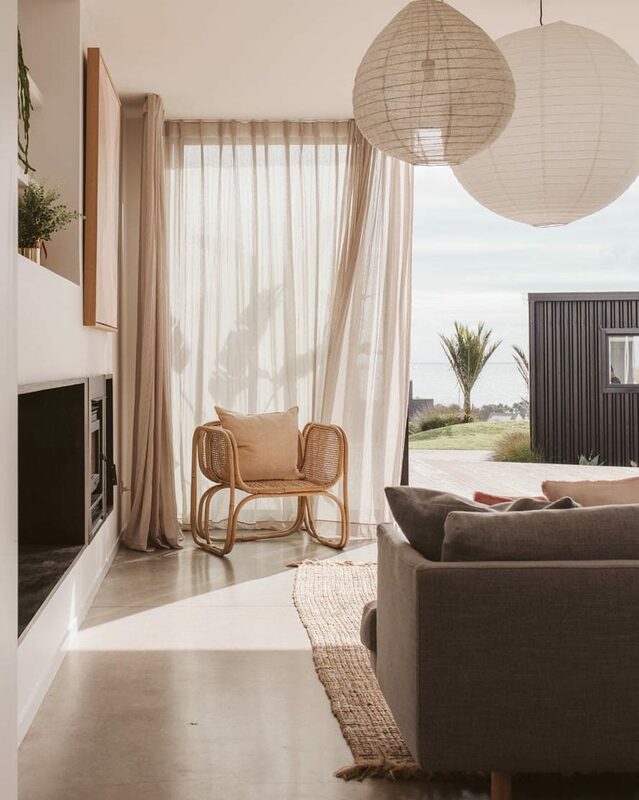 Spatial/interior designer Thandi (owner of Thandi Jazmine Design) managed the project and interior, while Bachelor (who works on Taranaki’s oil sites) took care of the wiring, painting (with Thandi’s cousin Jarrod Murray) and decking. It all meant many late nights, and Bachelor worked on the house so much that the odd contractor thought he was one of them, but at the end of day, the savings were worth it, says Thandi. TOP Tucked behind the couple’s bed are a walk-in wardrobe, and an ensuite positioned to take in the ocean view. 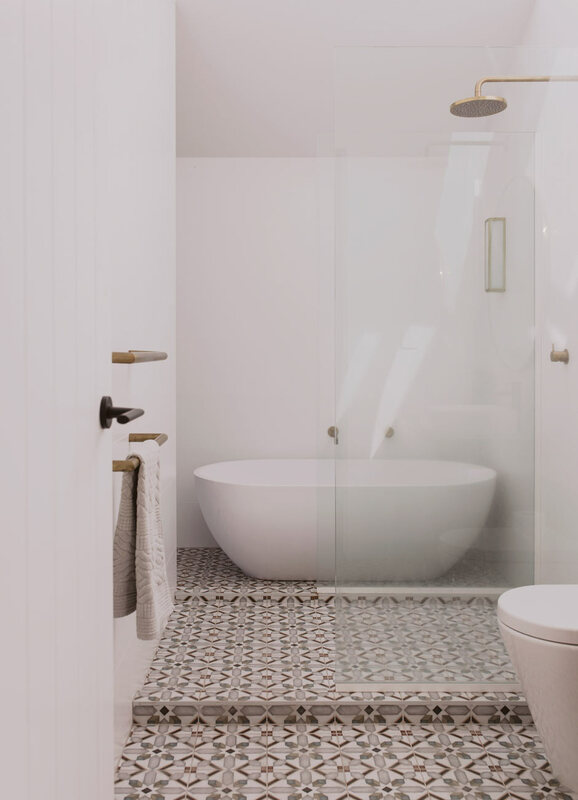 ABOVE “It’s just the best,” says Thandi of the seascape from the ensuite’s deep stone bath. 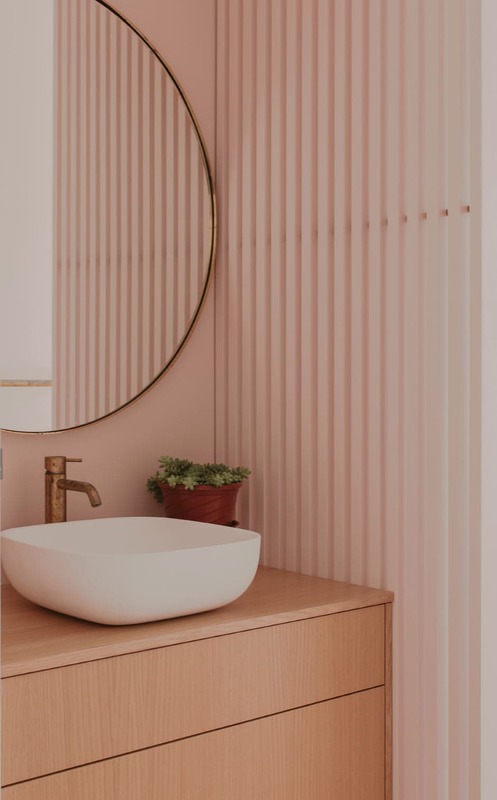 She and Bachelor chose brass fixtures for this space, including a custom-ordered towel rail from Plumbline and a Mashiko wall light by Astro Lighting from ECC. The porcelain tiles are Demel Multicolor from Tile Space. The interior mood is relaxed, though the devil is in the detail. 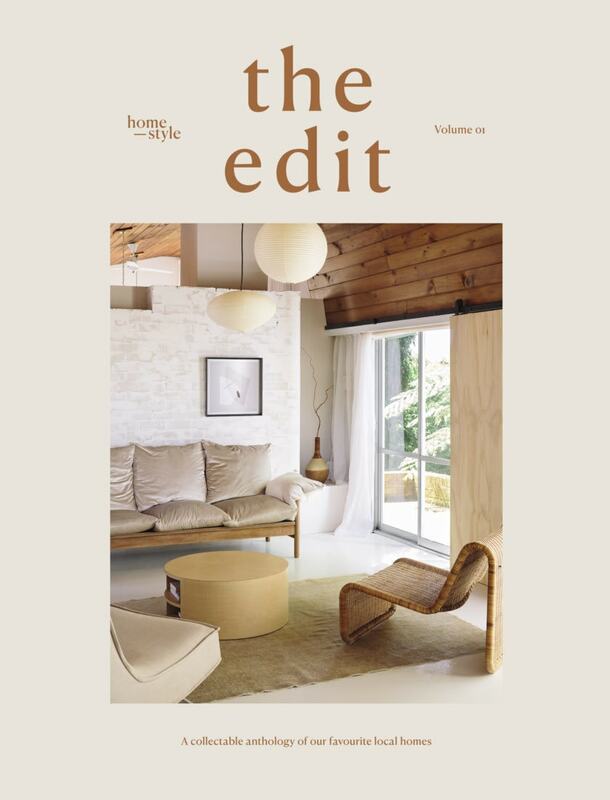 “Our home could be described as purposeful, with clean lines and honest materials,” says Thandi. The ground level’s concrete floor is untinted with a matte finish, and a plywood stairwell at the rear of the home leads upstairs, where the flooring is plywood too. “Nothing too fancy,” says Thandi. In keeping with this low-key vibe, whereas most people like their kitchen to be the heart of their home, this one was intended to recede. 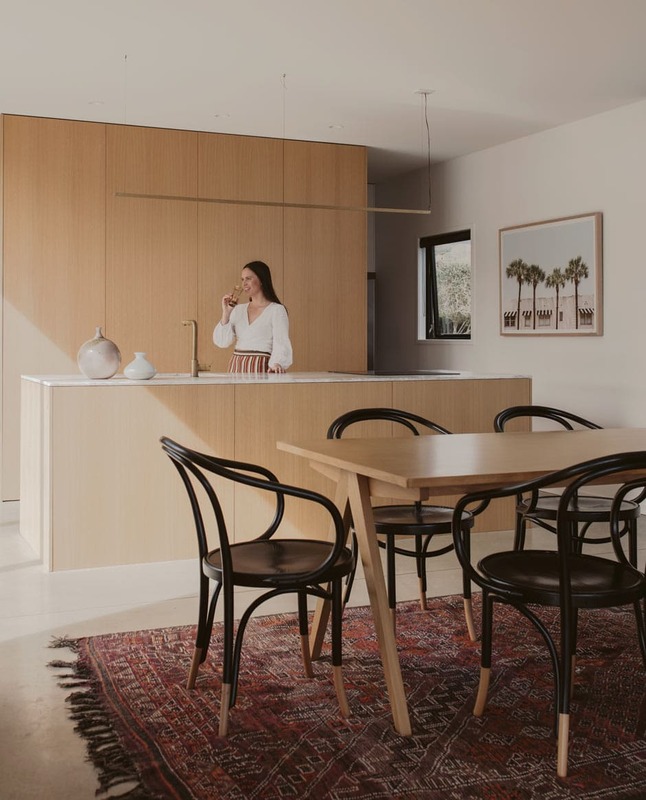 “We prefer rooms that are just big enough to serve their purpose, and designed the kitchen to have a minimal impact on our living areas,” says Thandi of the space crafted by Nick Dunne of Objects Custom Joinery using oak veneer. “We chose beautiful materials but wanted them to become part of the whole space, to bring the focus to our dining area where we spend time with family and friends, and our living room with its sea view.” For optimum functionality, there’s an extra sink, bench and storage in the scullery around the back. TOP Angled into the bush across the lawn from the main house is a self-contained studio, named Miharo, that provides accommodation for visitors, is used by Thandi for meetings and is rented out on Airbnb. 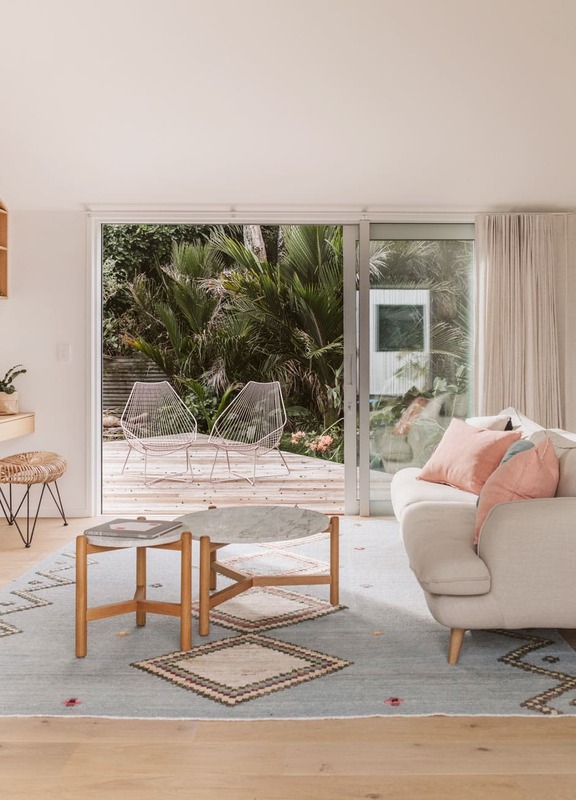 Some of the key décor items featured here include marble coffee tables from Freedom, a sofa available through Thandi Jazmine Design and wire outdoor chairs from Junk & Disorderly. MIDDLE The interior of the one-bedroom studio is ultra-peaceful – you can hear the birds singing in the bush and the leaves rustling in the wind. Sliding doors (with a cedar screen for privacy) allow the kids to toddle across the grass between the two dwellings. 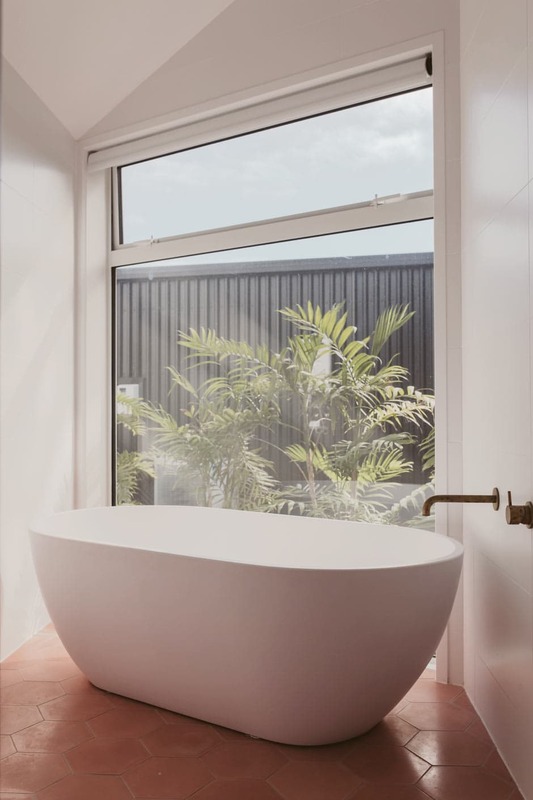 Dulux Rangiora and Pink Hex tiles from Gallery 4 are a sweet touch in the bathroom, where another luxurious bath enjoys a lovely view – this time of a stand of nikau palms. ABOVE ‘Miharo’ means ‘wonder’ in Maori – and, indeed, there’s muchto marvel at here, including all sorts of interesting angles and nooks.